Palladium is the only metal that has hydrogen permselectivity. 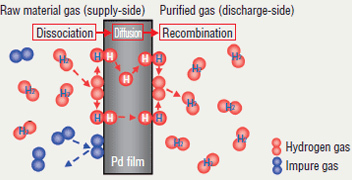 TANAKA has succeeded in developing a purification process for hydrogen gas that exploits this permselectivity. 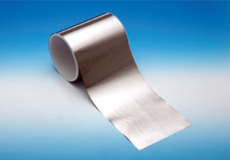 With our ultra-thin film processing technology and highpurification technology, we are able to offer highly reliable hydrogen permeable films with maximum hydrogen permeability. High-purity hydrogen gas purifiers, steam reforming based hydrogen production units, etc. ＊ The ranges of plate thicknesses and widths that can be handled vary depending on the alloy composition. ＊ For specification range of repeat produced products, please contact us separately.